MEMPHIS, TN – If you are having stroke symptoms, you should rush to the hospital as soon as possible. Every minute that you delay will cause the death of 1.9 million brain cells, a leading international nursing expert in acute stroke management warns. 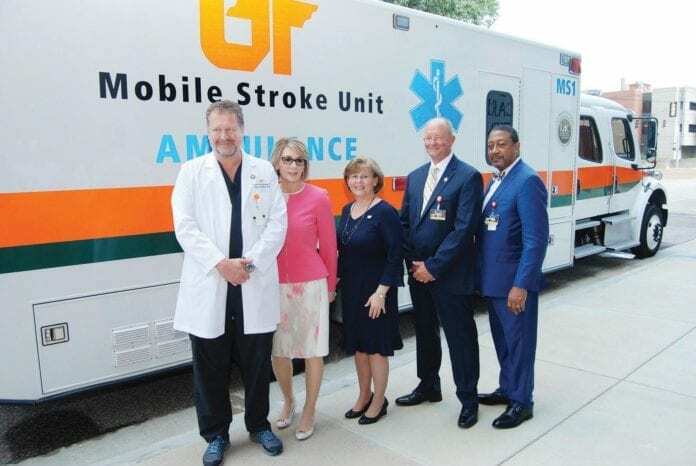 “People should not wait when having stroke symptoms,” said Dr. Anne Alexandrov, a professor at the University of Tennessee Health Science Center College of Nursing and chief nurse practitioner of the UT Mobile Stroke Unit. Accreditation Commission (IAC) the unit’s advanced technology. 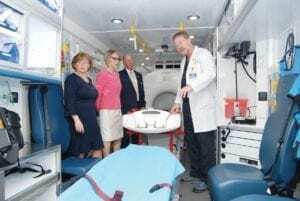 On June 26, Dr. Alexandrov and a team of clinical experts and administrators touted the virtues of the UT Mobile Stroke Unit, which was on display in front of the UTHSC Center for Healthcare Improvement and Patient Simulation (CHIPS) at 26 South Dunlap. Weighing in at 14 tons, the comprehensive stroke center on wheels is equipped with a hospital-quality CT scanner with advanced capabilities for brain imaging as well as imaging of the blood vessels in the brain. Launched in 2016, the $1.1 million stroke center is capable of responding and treating stroke emergencies on average 72 minutes faster than the traditional hospital response time and can improve the odds of recovery, the experts say. Unlike other mobile stroke units, the team of experts on the UT Mobile Stroke Unit quickly preps the stroke patient before the trip to the catheterization laboratory, Neuro Intensive Care Unit or Hospital Stroke Unit, thus bypassing the emergency room altogether. The rollout of the Mobile Stroke Unit was also ripe for the announcement of the first-of-its-kind national accreditation from the Intersocietal Accreditation Commission (IAC) for patient safety, radiation safety, dedication, continuous improvement, and commitment to quality care. The IAC is a nonprofit organization that evaluates and accredits facilities (including UT’s Mobile Stroke Unit) that provide diagnostic imaging and procedure-based modalities. The mission is to improve health care through accreditation. The CT mobile unit is the first of its kind to receive accreditation in the country. It is a distinction that sets the technologically advanced mobile stroke unit a world apart from others. Dr. Andrei Alexandrov, professor and chair of the Department of Neurology at UTHSC, is the medical director of the Mobile Stroke Unit team. (He is married to Dr. Anne Alexandrov.) Since its rollout, the mobile CT unit has responded to emergency calls at least four to five times a day. He said it takes the team approximately seven minutes to arrive at a diagnosis after the mobile stroke unit pulls up to the scene, which, he added for example, is three minutes longer for paramedics to assess patients with chest pain. Stroke statistics are rather grim in the United States. It is the leading cause of death and the No. 1 cause of permanent disability in adults. Dr. Alexandrov and the stroke unit team are striving to reduce the treatment time to improve the odds of recovery after a stroke occurs.